I hope you all had a happy Valentine’s day. It’s always nice to receive a token of affection even if it’s just someone sending you a card or a special note, a smile, a wink, something that lets you know that you are very special to someone. So If you didn’t do that for someone you care for, don’t hesitate to to do it now. Trust me, it will not matter that it’s not Valentine’s day – they will love it all the same. We should always try to remember to let folks know how we feel about them. When you are gone, people will not remember what you did, or how well you did it, or whether you argued with them or helped them, BUT, they will always remember how you made them feel. So go for it – make somebody feel special today. I think I did some good articles this month. You will notice that I included an article on Acrobat as well. I find that just about every client I have uses Adobe Acrobat and .PDFs in their offices. So it just follows that they could benefit on some how to articles too. Please let me know if you enjoyed this article and whether you would like more in the future. As always, I love to hear from my readers so don’t be shy about asking me to cover something you need to know about. Until next time, be kind to one another…. 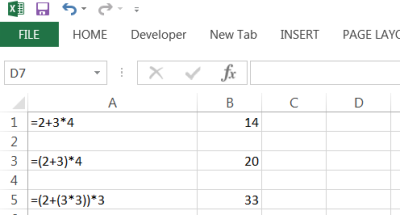 When you are performing calculations or doing just anything in a formula in Excel, what resides inside your parentheses will the first thing evaluated. If there are more than one set of parentheses residing in the same formula, they will be evaluated inside-out, which means that the content residing in the innermost set of parentheses will be evaluated first and then the content in the next set of parentheses, until the last set has been reached. You can use parentheses any time you need to group together a set of numbers, formulas or functions, including when you are using comparison operators. The only thing that will change is that your formulas will look more complex. You can use parentheses with functions as well. Of course, it starts to get a bit confusing the more parentheses you use and the more complex it becomes. Just remember how Excel calculates: inside-out – and keep that in your mind as you continue to build the correct structure.